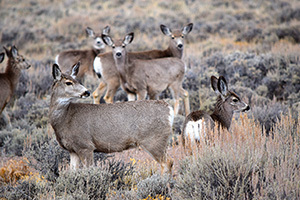 Migratory mule deer in Wyoming closely time their movements to track the spring green-up, providing evidence of an underappreciated foraging benefit of migration, according to a new study from a team of researchers led by University of Wyoming and U.S. Geological Survey (USGS) scientists at the Wyoming Cooperative Fish and Wildlife Research Unit. The new results indicate deer’s surfing includes stopping over at various points along the way, prolonging the animals’ exposure to high-quality forage along the entire migration route. The findings are reported in a paper released to the public last week. The paper will be published in the June issue of the scientific journal Ecology Letters. The researchers gathered movement data from 99 adult female mule deer -- ranging from 2-12 years of age -- which migrate north in spring along the Wyoming Range, a productive mountain range in western Wyoming that is the southern extent of the greater Yellowstone ecosystem. The deer were fitted with GPS tracking collars that logged their locations every 1-5 hours. For three years, daily movements of deer during the spring migration were matched with dynamic maps (from remote sensing imagery) to determine how closely each deer's movements overlapped with the timing of early spring green-up, when the nutritional value of vegetation peaks. All deer showed evidence of green-wave surfing, and roughly one third of them perfectly matched their movements to the timing of green-up. Little is known about what makes one deer surf well and another surf poorly. The study found that the degree to which mule deer surfed the green wave along their migratory routes was unrelated to their age or body condition. Instead, how well deer surfed depended on the manner in which the spring green-up spread across the landscape. Mule deer surfed better when their migration routes had a longer green-up period, a more rapid rate of green-up, and when the timing of green-up progressed consecutively from winter to summer range. The researchers have dubbed this characterization of the green-up pattern the “greenscape.” A route's greenscape was the primary factor determining how well individual deer surfed the green wave. “The sophisticated analysis used here sets a new standard for work on migration of large herbivores. It is a very impressive coupling of extensive movement data with satellite data,” says Atle Mysterud, professor at the University of Oslo. "It allows a new level of detail in separating out the behavioral and the landscape part of green-wave surfing." The study was conducted in collaboration with the Wyoming Game and Fish Department, which is charged with managing Wyoming's big-game migration corridors. The work is part of ongoing research that seeks to identify and map Wyoming’s big-game migrations and understand the influence of development and climate change on this important behavior. It is funded, in part, by the USGS through the Wyoming Landscape Conservation Initiative and the National Climate Change and Wildlife Science Center. The research also was supported by several sportsmen's groups in Wyoming and other state and federal agencies in the region. You can follow Wyoming’s big-game herds during their spring migration. Check out the Wyoming Migration Initiative’s Facebook page for weekly maps and updates.